"Then she lifted from her lap a great stone of a clear green, set in a silver brooch that was wrought in the likeness of an eagle with outspread wings; and as she held it up the gem flashed like the sun shining through the leaves of spring." 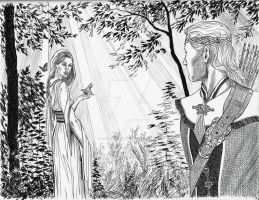 Left wing: Idril with little Eärendil and the Elessar on her neck flee Gondolin, Glorfindel fights the balrog to protect their retreat. Right wing: Aragorn (Elessar) with the Elessar on his breast looking at Eärendil the night before the battle before the Black Gate. For the "Gondorian Seedling" art contest of Czech Tolkien fans with the topic "Last Hope". Awesome job! Very unique composition. Krásná práce, zajímavý nápad, zkombinovat tyto scény. A skvělé provedení; na první pohled člověk vidí jen toho orla (Elessar) a teprve postupně se ukazují všechny ty detaily. Tahle práce mě na výstavě na Tolkienconu zaujala. Kolikátá vlastně skončila? Whoa! Really amazing job here!